VERICUT’s optimisation modules automatically modify feed rates based on the cutting conditions to make your programs more efficient, while also extending tool life and improving surface finish! Two independent modules are available for optimising feed rates: OptiPath and Force. 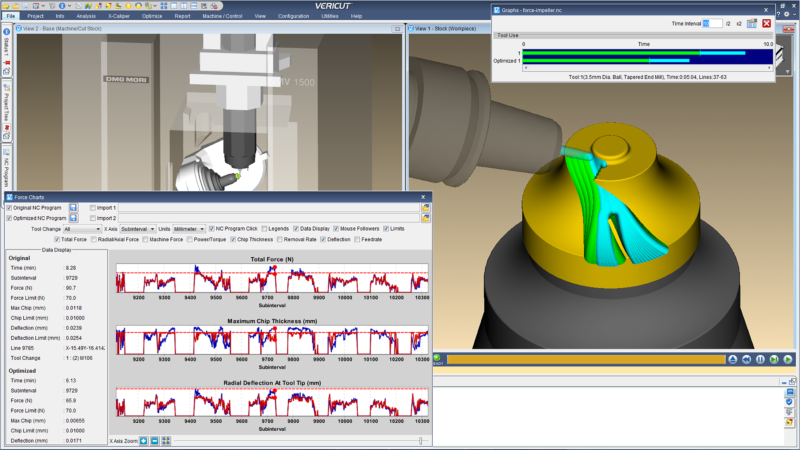 CGTech’s VERICUT Force is a physics-based NC Program Optimisation software module that analyses and optimises cutting conditions throughout CNC Program operations. VERICUT Force makes the most effective NC program for the given material, cutting tool, and machining conditions. The result is significant time savings, and improved cutting tool and machine life. Force provides the NC programmer with information never had before. Now NC programmers quickly and easily visualize what is happening cut-by-cut in the NC program as the tool contacts the material. With VERICUT Force you clearly see underutilised cutting conditions, excessive forces, metal removal rates, power, torque, and tool deflections. With a single click, the user sees a visual analysis in the NC program and also in the graphic review window. Force has built-in material information that gives a revealing analysis of the machining process before running the NC Program on the actual machine. Force provides the user with a proactive analysis on NC programs, making them right the first time, a process that has been reactive in the past. 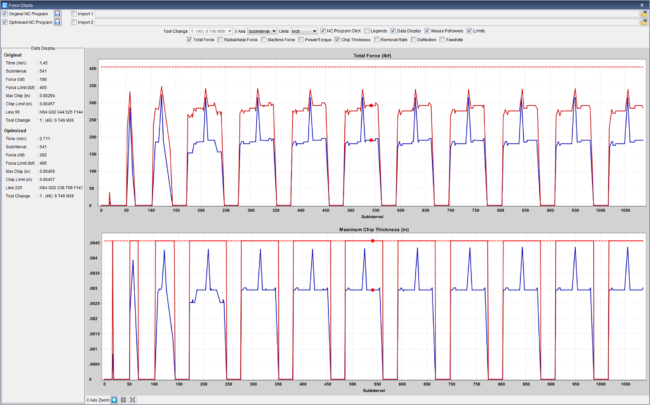 VERICUT Force makes optimising an NC program fast and easy. Force calculates the contact between the tool and material, cut-by-cut. Force also takes the cutting tool edge and the material into account to adjust the feed rates to be optimal and constant. VERICUT Force’s material catalog is complete with ISO PMKNSH materials. VERICUT is a true knowledge-based machining system. Through the simulation process, it learns the exact depth, width, and direction of each cut. And it knows exactly how much material is removed by each cut segment. With that knowledge, motion is divided into smaller segments and the best feed rate for each cutting condition encountered is assigned. It then outputs a new tool path, identical to the original but with improved feed rates. It does not alter the route of the tool path. OptiPath uses standard machining formulas, setting the feed rate based on the user’s desired volume removal rate, chip thickness, and surface speed. A setup wizard prompts for cutter settings as you simulate machining operations. Essentially, you add intelligence to the cutter. All the settings for that cutter are stored in an optimisation library. You define the settings once. Then each subsequent time you simulate machining operations with that cutter in the same material and machine the motions can be instantly optimised. OptiPath also features a “learn mode” for creating the optimisation library with no setup required. For each cutter, OptiPath finds the maximum volume removal rate and chip thickness and uses them to determine the optimisation settings for the cutter. Both methods produce optimised feed rates and achieve impressive reduction in cycle times, improved cutting tool performance and better surface finishes, less tool wear, etc. Both excel in improving NC programs machining any material type from Non-Ferrous materials like: Aluminium, Steels, Stainless Steels, Titanium, Super Alloys, Heat Resistant Alloys, and Hardened Tool Steels. They both efficiently optimise complex five axis parts. OptiPath, being knowledge-based, requires more knowledge from the user to make the correct cutting condition settings. OptiPath is most effective when ideal cutting conditions are known for each cutting tool, material and machine. Force, being physics-based, requires less user experience or knowledge of cutting conditions. The user has minimal inputs to get effective optimisation results.